After completing the latest test and adding a very light, sort of arbitrary color correction to it, I've realized that we've created the now somewhat infamous Teal and Orange look from the summer blockbusters. Given that this is not a blockbuster and for that matter a totally different dimension, we began thinking about how to create a sort of pleasing color palette. With this, my plan is then to create a sort of color script that we can use during the course of the shooting and color correction process. The idea came from Michelle Robinson's visit, a Look Development artist who works at Disney Studios, who's worked on films like Tangled and Bolt. Starting with the animatic, I've identified some colors to begin the process. These are the colors pulled from the storyboards containing the Lotus flower. It will be mostly greens sticking around purplish pinks to create a nice complementary color set. 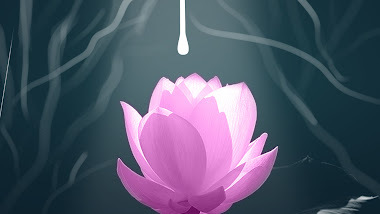 These are the analogous colors to the pink in the lotus, what's exciting to me is that there are lavender colors there as well as the fleshy pinkish tones of human skin. Something that we've been talking about keeping in these more lifelike scenes by allowing the human skin tone to show through under the make-up. The Mother scene in the middle where the creation of life starts is very monochromatic and cool, heavily depending upon the somewhat teal and dark blue spectrum. This is a triad taken from the darker teal color in the spectrum. It yields some nice colors, including the mauve-like colors as well as the more olive colors. These can perhaps be brought in as accents to the rest of the piece, I was thinking of actually pushing the mauve to a more royal purple especially in the scene where she is sitting on the throne. The olives can perhaps go in the scenes as the branches begin sprouting from her. Here is a compliment of the dark blue color, what I like is that while it does skirt the edge of teal and orange, these compliments are really more brown like the bark from a tree perhaps. We may be able to introduce these more brown colors as the branches grow from her. Not incredibly brown; however, I think these will need to pushed back a bit in saturation.